Around Christmas time the bookshelves of the nation groan under the weight of books targeting the ‘difficult relative’ market; those people you have to buy for but don’t really know well enough to know what to give. People seem to think books are safe but rather boring and that may well be true if you get the wrong one. I’d like to make a recommendation for the perfect book for a friend or relative who’s not the type to sit and read a book from start to finish, who likes a book to dip in and out of and the type who likes lots of pictures and a chance to be fascinated by how other people ‘do’ things. In short, this is the perfect present for the person who likes to do their reading in the ‘smallest room’. 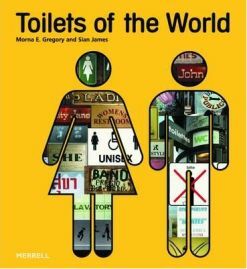 Toilets of the World by Morna E Gregory and Sian James will fascinate, horrify and entertain in equal measure and will certainly beat that 15 year old copy of the Guinness Book of Records that’s been stuffed behind the U-bend for the last ten years. My husband has the makings of a perfect toilet inspector. He’s fascinated by how loos vary and how they work around the world and he has a bladder like a peanut which means plenty of opportunity to check out the facilities. By contrast I have a bladder like a camel’s hump – I can cross deserts without needing to stop and go, especially if I’m in fear of a really stinky, nasty hell-hole. As a result my husband has been known to come out of a ‘convenience’ in a far flung place and demand my camera so he can go back and take a photo. My friend Alex is even more obsessive – he has a photo from Pushkar in India which he describes as looking like the user had gone into the cubicle and exploded in 360 degrees. Boys and loos! Who knew they could find such joy. We saw a Toilets of the World calendar in a book shop last year and I then tracked down the book. It lives in our guest bathroom as it undoubtedly should. In their introduction, the authors propose that studying toilets isn’t as frivolous as it may seem and suggest that toilets offer a valuable insight into culture and sociology and that far from being the same wherever you go, there are enormous differences and that you can learn a lot from a closer look. Peeing and pooing are life’s great levellers – everyone does them, from the queen and the pope to the man living under the railway arches. And of course, they claim that the ‘throne’ is often a place where people have their best ideas – and perhaps in some cases, do most of their reading. After a brief introduction to the history of the toilet, we are taken on a world tour by the authors. We start in North America which is fair enough, given that the authors are Canadian. They reflect that Americans use more water per flush than any other region and go out of their way to avoid the use of the word ‘toilet’, preferring the laughable euphemisms such as the ‘rest room’ or ‘bathroom’. Each toilet or urinal described comes with a photo and a short commentary on why they are interesting or significant. They range from a lavvy chosen because of the punk graffiti, to a submarine ‘head’ and a NASA outer space loo which both illustrate the challenge of adaptation to unusual environments. There are some gorgeously tiled urinals that look more Portuguese than American, and my favourites are the astonishing entry on the ‘L’Urinette’ – a device that allows ladies to pee standing up – and the tree carved with an arrow pointing to its base and the letter P.
Next stop is Central and South America where the photos tend more towards the scenically placed or ingeniously constructed outhouse rather than technological wonders. There’s a hilarious photo shot through the ‘hole’ of a stilted over-water toilet revealing an unsuspecting snorkeler passing below, fortunately without anyone passing anything above. A close escape! At the other end of the technological spectrum is a photo from Brazil with a (to my eyes) Japanese-style high tech loo with automatic plastic sheathing on the seat, no need to touch anything and lots of motion sensitive (no pun intended) features, sitting proudly beside an overflowing bin full of used loo roll. Top tech toilet but sadly the pipes are too narrow to deal with the paper. Next step Europe and we meet glowing egg-shaped toilets in a London club, retro public loos in Brussels, French ‘squatters’ that will invoke bad memories about childhood visits to French campsites, unisex loos, chintz covered toilets, disappearing subterranean pod toilets that only pop up at weekends, and a loo with a transparent water tank that’s home to some goldfish. African examples, a little like the ones from Latin America, tend towards the scenic beauty examples with huts standing in the middle of nowhere, overshadowed by sand dunes or mountains. Apartheid era is remembered in a Johannesburg building with separate toilets for black and white users, whilst the owner of the transparent toilet seat with lengths of barbed wire inside is clearly making a bit of a political point. The Oceania chapter is heavily influenced by Australia and New Zealand, large countries without a lot of plumbing outside the big cities and hence the need to be creative. ‘Longdrops’ and ‘dunnies’ abound, many of them in neat little tin or wooden sheds. The beautiful QVB building in Sydney is featured in all its Victorian era glory with a ‘four at a time’ urinal of such lavishness that it contrasts nicely with the collapsible ‘thunderbox’ which follows. Finally we’re in Asia, the region of the squat loo for most and the gold toilet in the bathroom of a Hong Kong jeweler. As Karl Pilkington commented in the series ‘An Idiot Abroad’ the Chinese can build the Great Wall but can’t find a few bits of MDF to build a partition round a toilet and there are several examples of the lack of privacy in the world’s most populous country. I was pleased to see an example of the East-West toilet we had in Rishikesh, India, last year where the design enables both the sitting and squatting approach to getting the job done. If I had one complaint about this book it would be that there are toilet types I’ve seen around the world that I would have considered more interesting than many that are included but let’s be fair, with billions of bogs to choose from, I can’t expect they’ll find my favourites. The omission of any photos of a German ‘poo platform’ toilet is however unforgivable. Toilets of the World isn’t book to read in one ‘sitting’ but it’s a fascinating volume that illustrates the ingenuity of the human race, the crassness of those with too much money, the humour of some without, and the many and varied ways that have been developed to deal with life’s necessities. I would suggest it’s just as likely to be popular with the more widely travelled reader who may recognise many of the styles as with those who’ve never stepped outside the realms of a standard black and white Armitage Shanks. There’s something in here to amuse and educate all but the most delicate of readers. And for those who might fear otherwise, the pictures are almost without exception clean and lacking the evidence of their subjects’ purpose. Sadly the same can’t be said for some of my husband’s and my photos. Enjoy! One Comment on "Toilets of the World"